Health Fair | Oshwal Association of the U.K. Sat 1st June 2019 & Sun 2nd June 2019 at Oshwal Centre!! 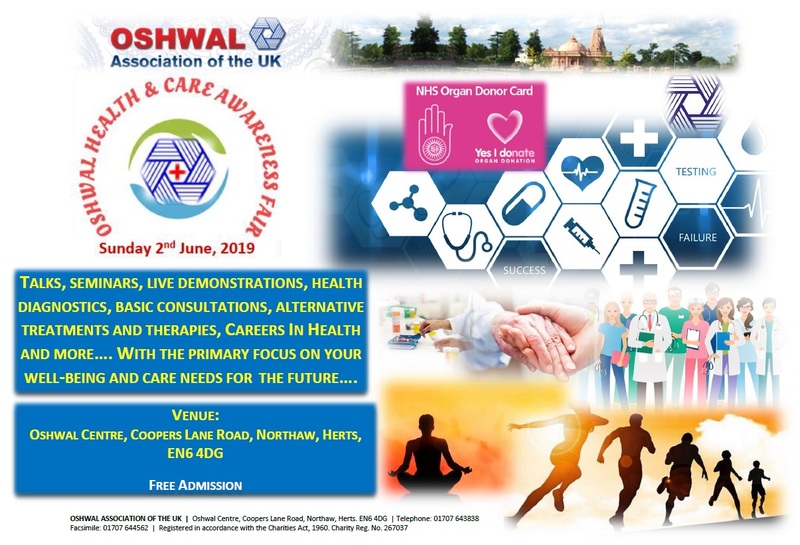 Below are details of a mega event being organised by the Oshwal Association of the UK – Oshwal Health & Care Awareness Fair, on Sunday 2 June 2019 at Oshwal Centre. The Fair is aimed at all members, young and old, and will focus on health, well-being, care and career opportunities. Please tell all your family and friends to put this date in your diaries. If you require additional information please contact us on OHCAF@oshwal.org. a healthy diet and lifestyle including alternative medicine and therapy. The Fair will host prominent specialist speakers to provide an overview of particular health issues and the specific care requirements. Also there will be speakers who will be able to share their experiences of dealing with specific health issues. Due to limited places for the talks, pre-registration will be required. This zone will be manned by professionals who will be offering general health advice and advice on careers in health and social care. Attendees can talk to people working in these professions and get insights into the institutions and companies they work for, or businesses they manage and what career development opportunities are available. The Fair will also have workshops including basic first aid. Due to limited places on these workshops, pre-registration will be required. There will be diagnostic testing including among others hearing, eye, dental, blood sugar checks, etc undertaken on the day. Due to limited places for these checks, pre-registration will be required. During the day there will be regular healthy food cookery demonstrations. During the day healthy refreshments will be available for a nominal price. There will be stalls offering information and products. There will be stalls offering information and products. A limited number of stalls are available for £125 for the day. If you require a stall please contact us on OHCAF@oshwal.org. A brochure is being produced for the Fair. If you are interested in advertising in the booklet please contact us on OHCAF@oshwal.org. As you will appreciate to organise an event of this magnitude we need a large number of volunteers including medical professionals. We have had a fantastic response to this with over 300 people registering to volunteer. Accordingly we have closed the volunteer registration. We would like to thank everyone for their amazing support. We look forward to seeing you all on 2 June 2019.